In this heartwarming tale, twelve-year-old Claire Boucher has a pretty good life in Vermont. Her parents gather maple sap from over 500 trees each year. She does well in school, she has a solid best friend in Natalie, and she loves skating. When a high-profile Russian skating coach spots her at the Maple Show, he offers her a scholarship for training in Lake Placid, an hour-and-a-half drive from Mojimuk Falls. How can she say no to such a magnificent opportunity? At the same time, how can she expect her parents to drive her to Lake Placid several times a week? She accepts the scholarship and is thrown into to a whirlwind of excitement, self-doubt, exhilaration, no time for Natalie, new friends, cutthroat competition, and intangible rewards. After a lot of heartache and missteps, her skating improves but she still misses the other things in her life. And the training atmosphere is not quite what she expected, either. Fourth graders and older, especially girls, will love the idea that anyone can be discovered. Readers will learn a lot about competitive sports, and specifically skating terms. Claire’s math project about Fibonacci numbers is a strong theme that should interest even haters of math. Both of these themes provide ample room for reading activities. Ultimately, Claire learns a lot about herself and about what’s important in her life. She learns to stand up for herself and that it’s okay to say no. 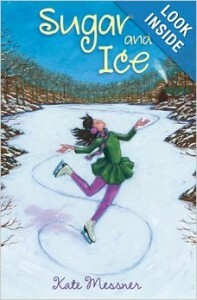 Learn about the author and her other books at her website: www.katemessner.com. Eleven-year-old Tess Brooks is looking forward to meeting her new foster brother, Aaron. Will she be able to handle all the baggage that he arrives with? Tess is a happy, well-adjusted girl who knows her own mind. She also knows the tiny Maine island on which she lives. The island is so small that the state is threatening to close the one-room school she and the other island children attend. Her mother is the teacher, which means her family would need to relocate if they lose her mother’s income. Partly as a response to the school situation, several families accept foster children to have more students. Tess’s family adds a thirteen-year-old boy whose mother struggles with drugs. The reader is invited aboard a lobster boat and also gets a big dose of life in a small town. Tess is a quirky mix of superstitious eleven-year-old and caring sister. Aaron has a chip on his shoulder, but he’s ultimately pragmatic, loving, and talented. Other wonderful characters include little sister Libby, irritating neighbor and nemesis Eben, and nosy neighbor Mrs. Coombs. Lord deals with all the issues facing Tess with her usual compassion and tenderness, but these are large issues. 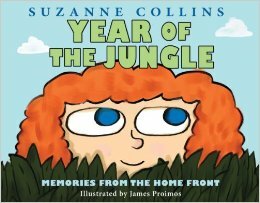 Fourth grade readers will find a lot of information about how an uncertain future, a shaky past, and a sometimes-painful present can affect people. We can’t always control the situation, but we’re stronger than we think. 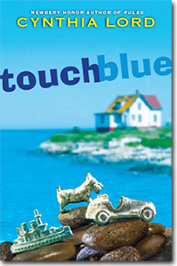 Touch Blue has won numerous awards and appears on many reading lists, including Book Page Best Children’s Books of 2010. Learn about this and more titles from Lord’s website: www.cynthialord.com.